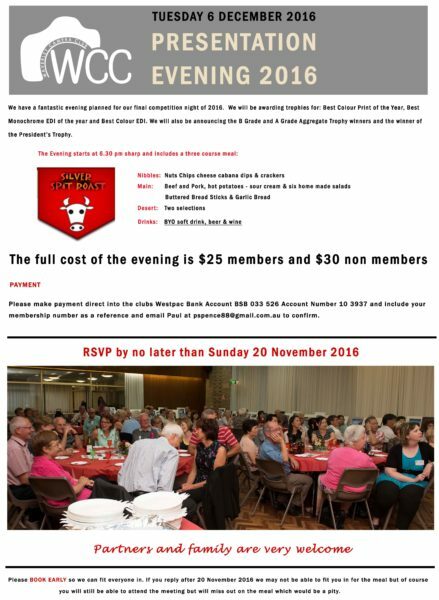 It is with great pleasure that we announce the 3rd WCC Annual Presentation Night to be held in Mt Waverley Community Centre’s Main Hall on Tuesday 6th December 2016. As per the flyer below, we have a great night planned this year we will be awarding trophies for Best Colour Print of the Year, Best Mono and Best Colour EDIs of the Year. We will also be announcing the A and B Grade Aggregate Trophy winners and of the prestigious, world renowned and much sort after, President’s Trophy.